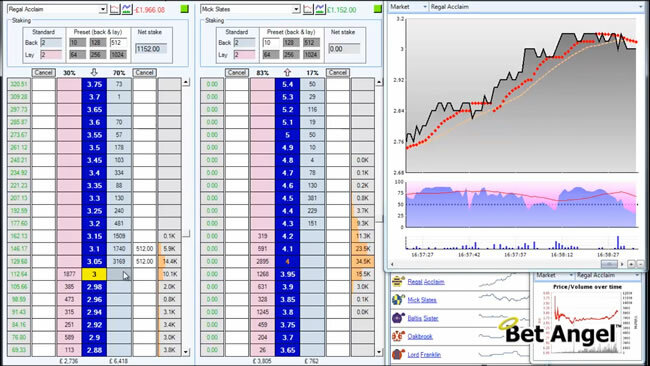 Bet Angel Professional for Betfair offers a huge range of charting options, from enhanced Betfair charts, additional micro charts right through to fully customisable advanced charts! 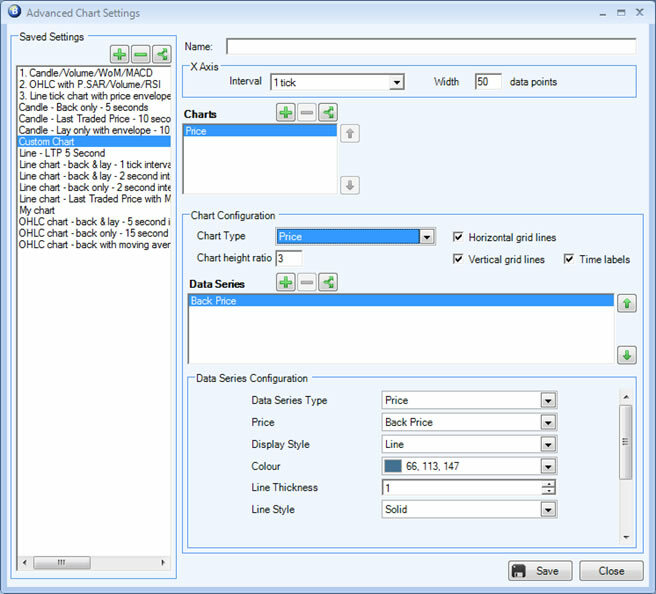 Even the most demanding chartist will find the fully customisable charting options easy to use and quick to set up. Line charts, OHLC, bar and candle stick charts monitor the progress of price, volume and other metrics. You are sure to find a chart set up to match your needs. Create or layer as few or as many charts as you wish each individual to each market selection. Then apply a whole host of indicators onto each of these chart. Many popular indicators can be overlaid to give price envelopes, MACD, relative strength, Parabolic SAR and so on. Once created, you can switch between each chart with just a couple of clicks of your mouse. You can also zoom in and out to look at key turning points in the market and pan backwards and forward across all price action. 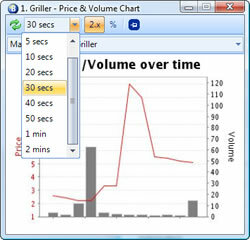 It’s the most advanced charting available for Betfair! Here a chart is being used in conjunction with the ladder and 'pinned' on top to enable quick trading. The image to the right shows the pre-defined chart types supplied with Bet Angel and the configurator on the right. This is where charts and indicators can be layered on top of each other to create a truly unique chart set up for your own personal strategy. Try Bet Angel for a month for only £15 or FREE for seven days. Our popular Bet Angel VPS solution is also available for a one month period.